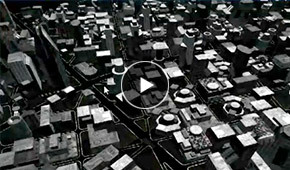 Watch these two brief videos to see how to create your first smart 3D city model. Downtown Damage shows a downtown scenery of a central European city with different degrees of damage in street and building models. Medieval Town features a European Medieval Town, embedded in a hillside with a lot of small pathways which traverse the idyllic scenery. Paris features a Parisian-like city with two levels of detail arranged around a logo on a fully dynamic city layout. Instance City contains two scenes that apply rules to instance pre-modeled building assets. Pompeii allows you to discover the ancient city of Pompeii. 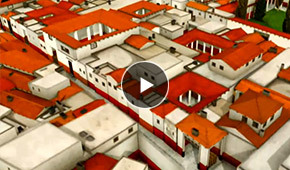 Now you can generate, explore, and edit ancient Pompeii. Venice demonstrates the efficient generation of a low-polygon city model based only on street data. 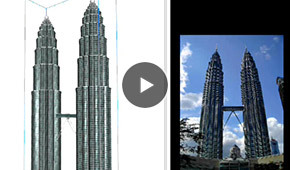 Petronas Towers demonstrates parametric reconstruction of the Petronas Twin Towers in Malaysia, including recursive setbacks, rotations, and level-of-detail. 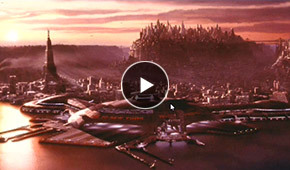 Future New York City allows you to generate, explore, and edit the New York City of the year 2259. Modern Streets provides example rules to generate detailed street geometry via parametric modelling only. CityEngine is a stand-alone desktop software application for the design, planning, and modelling of urban environments in 3D. The current release connects to the rest of the ArcGIS system primarily through data exchange, though this will become more tightly integrated in future releases. 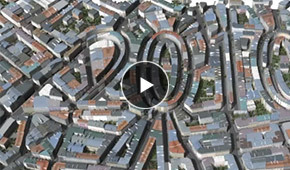 Quickly generate 3D cities from existing 2D GIS data. Do conceptual design in 3D, based on GIS data and procedural rules. Efficiently model virtual 3D urban environments for simulation and entertainment. CityEngine also provides advanced capabilities for the direct export of the generated 3D city models out to other software tools, such as data management/analysis packages (like ArcGIS), 3D editing software (like Maya or 3ds Max), geo-visualization tools (like ArcGlobe or Google Earth), game engines (like Unity or Unreal), high-end rendering solutions (like RenderMan), or web-ready cloud rendering services (like RealityServer). Intuitive editing of 3D multipatch models—new, easy-to-use editing tools for the quick sketching and texturing of 3D models (e.g., multipatch). Share 3D CityEngine Web Scenes on ArcGIS Online—Publish 3D city scenes directly to the web for sharing 3D models, analysis results, or design proposals with decision makers or the public. Based on WebGL technology, no plugin is required for most browsers. Visualize urban planning zoning rules in 3D—Zoning regulations are text-based descriptions (per city) of allowed building volumes, usage and density. They are the main tool defining the layout of a city and set the guidelines for growth and development. In most cases, however, they are hard to understand by the public and other stakeholders. CityEngine allows you to specify, visualize, analyze and store/maintain zoning regulations in 3D. Perspective Facade Image Cropping—Intuitive and effective tool for the preparation of facade textures from ground based facade images; perspective correction and region selection are done in one step. Improved Street Sketching and Network Analysis—Sketching of streets has been significantly improved with the new editing tools. After street network creation, the network can be analyzed by computing global integration, local integration and in-between centrality. For each street these three values are computed and stored as object attributes. Who can use Esri CityEngine? Procedural modelling means that 3D geometries and textures are constructed using rules (procedures) instead of labor-intensive manual modelling. A single procedural rule can be used to generate many 3D models. For example, the rule can make use of feature attribute information stored in GIS data—such as the number of floors, roof type, wall material type, etc.—to generate a series of alternate 3D models that accurately represent the properties of each feature. The more attributes you have, the more accurate the generated model can be. Where can I get these procedural rules? CityEngine comes with a number of example projects that contains rules that you can modify to see how the rules drive the 3D content. We also made generic rule sets available at our CityEngine Community and encourage the user community to share their rules as well. What are the version differences between CityEngine BASIC and ADVANCED? ADVANCED: Available as single use (node-locked) or concurrent use (floating) license and comes with all features including Python or advanced import/export formats support. BASIC: Available as single use (node-locked) license only. Comes with the most essential features for 3D city creation with support for GIS data import and export to CityEngine WebScenes. Export is limited to OBJ (not Collada or FBX). Suited for freelancers, hobbyists, and 3D artists. Can CityEngine create 3D urban models out of oblique imagery or point clouds? No. CityEngine does not yet provide solutions for automatic 3D urban reconstruction out of oblique imagery or lidar data. Is CityEngine a visualization and presentation tool? No. 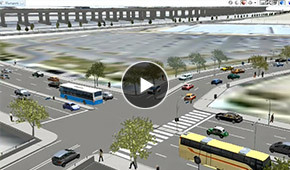 CityEngine's primary strength is in 3D content creation and its advanced export capabilities. However, CityEngine content can be used in all kinds of commercial and proprietary visualization solutions. Can CityEngine host 3D content on the web? No. CityEngine is not a web client. It does not contain any web-enabled capabilities, though it can export generated content out to ArcGIS Online. What is a 3D CityEngine Web Scene? A 3D CityEngine Web Scene is a 3D urban (city/campus) scene with limited extent. It can be hosted on ArcGIS Online and viewed in 3D in the browser. The recommended maximum unzipped size is 70Mb. What are the main features of the 3D Web Scene Viewer? The 3D Web Scene Viewer is an application on ArcGIS Online that allows you to view 3D Web Scenes. No plugin is required for most browsers. Layer views are supported and you can use a swipe tool for a side-by-side view of visible layers. Dynamic shadows, bookmarks and a search tool are also available in the 3D Web Scene Viewer. How do I create a 3D CityEngine Web Scene? 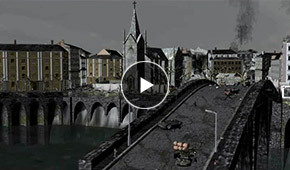 A 3D Web Scene can be created using CityEngine. Load GIS data into CityEngine, apply procedural rules and publish your scene to ArcGIS Online from within CityEngine. At the CityEngine Community you will find a series of ArcGIS – CityEngine workflows that show you how it is done. Can I create and publish 3D Web Scenes from 3D Analyst? Yes, you can create and publish a 3D scene in ArcGIS using new procedural geo-processing tools. Note: CityEngine will still be necessary to author the rules that will be consumed in ArcGIS. What formats are supported by the 3D Web Scene? The 3D Web Scene is an export format (WebGL) of CityEngine. Any 3D format that can be imported into CityEngine can be exported to a 3D Web Scene. What are the browser requirements to use the 3D Web Scene Viewer? Because the 3D Web Scene Viewer is a web application for interacting with 3D images, you need to use a web browser that supports WebGL. The list below outlines the specific browser requirements for different operating systems. Mozilla Firefox 14 and higher. Google Chrome 20 and higher. Internet Explorer with Google Chrome Frame. Google Chrome Frame is supported on Windows 7/Vista/XP SP2 and higher. Safari 5 or higher with WebGL enabled. Mozilla Firefox 14 or higher. Google Chrome 20 or higher. How do I analyze these scenes? CityEngine is a 3D urban content generator. Bring your GIS data into CityEngine, create your 3D urban scene, and then bring it back into ArcGIS for further analysis. CityEngine fully supports the File Geodatabase including textured multipatches. Once you have done your analysis in ArcGIS (shadow impact, visual impact), load the analysis result back into CityEngine for publishing in 3D on ArcGIS Online. At the CityEngine Community you will find a series of ArcGIS-CityEngine workflows that include doing analysis on a 3D urban scene. Does CityEngine import Esri data formats? Yes, CityEngine supports reading and writing of File Geodatabase features (point, lines, polygons, AND textured multipatches) and Shapefiles. Will CityEngine replace ArcGIS 3D Analyst? No, CityEngine is a 3D content generator. This content can be loaded into ArcGIS 3D Analyst (ArcScene and ArcGlobe) for visualization, editing, and analysis. When should ArcGIS 3D Analyst be used instead of CityEngine? CityEngine's primary strength is in 3D content creation. Most other 3D GIS tasks, such as visualizing large numbers of 3D GIS features, running 3D analysis, and maintaining 3D databases, are best performed using the ArcGIS 3D Analyst extension tools. What are the system requirements for CityEngine? Does CityEngine run on Windows, Mac OS X, or Linux? Yes, CityEngine runs on all three major operating systems. A native 64-bit version is available for Windows (7/Vista/ XP). A native 64-bit version is available for Linux and Mac OS X with Intel processors (no CityEngine support for 32-bit or PowerPC Macs). Does CityEngine have native 64-bit support on all operating systems? Yes, CityEngine is a native 64-bit application. Therefore, if needed, CityEngine could make use of all your memory (and not just 2-3GB as in 32-bit applications). If I have an older version of CityEngine, how do I get the new version? Please visit the Customer Care Portal and log in using your Esri Global Account. Where can I get more technical information about CityEngine? Please visit the CityEngine Community for forums, blogs, and technical information.